New Delhi, April 6: Do you smoke cigarettes? 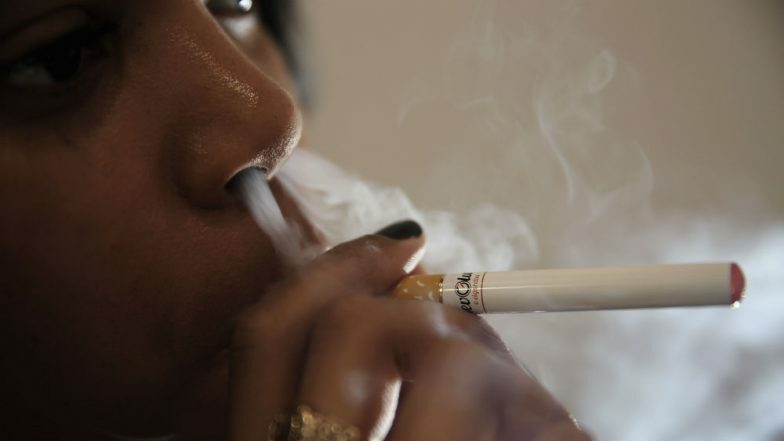 Think twice before taking another drag as it may not only damage your heart or lungs but can also make you blind, experts say. Smoking harms the retina -- the light-sensing tissue in the back of the eyes, responsible for transmitting images to the brain. "It's like a film of a camera which converts light rays into impulses which help us see," Raja Narayanan, Head of L.V. Prasad Eye Institute (LVPEI), Hyderabad told IANS. "Smoking increases the chemical compounds in the bloodstream thereby reducing blood and oxygen flow to the retina. This makes smokers two times more susceptible to Age related Macular Degeneration (AMD)," Narayanan added. A recent study, published in the journal Psychiatry Research, indicated significant changes in the smokers' red-green and blue-yellow colour vision, which suggested that consuming substances with neurotoxic chemicals, such as those in cigarettes, may cause overall colour vision loss. Smoking is one of the largest preventable causes of various diseases and premature deaths worldwide. Side Effects of Heavy Smoking: Nicotine From Cigarettes Can Damage Your Vision of Colours, Says Study. India was among the top 10 countries together accounting for almost two-thirds of the world's smokers (63.6 per cent) in 2015, according to a Global Burden of Disease study published in The Lancet in 2017. Smoking can further affect a bunch of eye diseases like cataract, glaucoma etc. While diseases related to the front of the eye are easily recognised, retinal diseases like AMD and Diabetic Macular Edema (DME) might develop silently and lead to progressive vision loss if not treated on time. "The symptoms of these retinal diseases are often confused with those of old age or other eye disorders which leads to delayed diagnosis," he added. People with diabetes need to be extra cautious of any vision changes and need to follow a healthy lifestyle as they are more susceptible to diabetic retinopathy. "Today, there are treatment options available that can slow or halt disease progression. Some of the treatment options available in India include laser photocoagulation, anti-VEGF (Vascular Endothelial Growth Factor) injections and combination therapy which includes laser and anti-VEGF treatment," Dudani asserted. According to experts, owing to an unhealthy lifestyle, dietary habits and constant stress and exposure to digital screens, the incidence of retinal diseases and other eye disorders is rising amongst the working population. They say that a cessation programme can help an individual quit smoking. "It can be advised to consult an expert and take up a cessation programme to quit smoking. Other than this, maintaining a healthy lifestyle and including a range of brightly coloured fruits and vegetables, that have antioxidants can help maintain retinal health," Narayanan said. "Dark, leafy greens such as kale, spinach, lettuce etc. have lutein and zeaxanthin - both important nutrients for eye health. Certain vitamins like vitamin C and vitamin A also help in overall eye health and help prevent the progression of AMD and DME," he noted.